Maxine Graham Price grew up in a military family and moved with them to many postings in the southern and eastern climes of the United States as well as Germany. Being a shy child and finding it difficult to make new friends easily, Price found the one constant in her life, other than family, to be her ability to draw and paint. 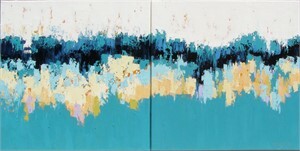 Price received her BFA degree in Art from the University of Texas at Austin and over her career has pursued various aspects of art including being a book designer, a fashion illustrator, an interior designer, a graphic artist, a portrait artist and a painter showing in numerous galleries and juried shows in the Southwestern United States. Many of her portraits hang on the campuses of The University of Texas at Austin, Texas A&M University, and St. Mary's University School of Law in San Antonio. 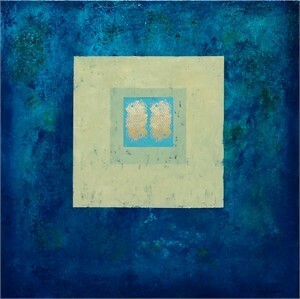 Her original oil paintings are in numerous corporate and private collections throughout the United States, Mexico, England, Germany, Japan and Bermuda. While still doing an occasional portrait, Price decided in 1992 to make creative painting a full-time pursuit and began a journey of experimentation and exploration, working with various mediums including watercolor, acrylics and liquid inks. 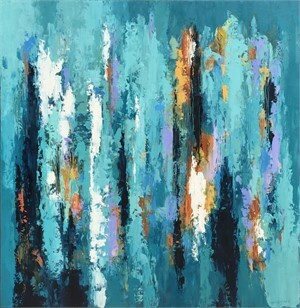 Several years ago, during a visit to San Miguel de Allende, Mexico, she began noticing abstract patterns in the ancient walls and began a series of abstract paintings, in oils with a palette knife, inspired by the colors and textures of old San Miguel. 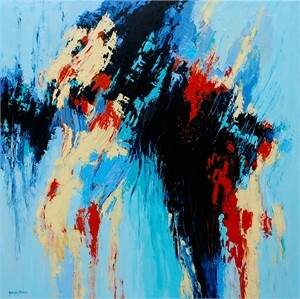 Thus began a love affair with oils, the palette knife and abstraction that continues today. I began experimenting with the palette knife about 20 years ago in an effort to capture textures that I couldn't achieve with a brush. Now, I find that I am no longer satisfied with what I call "flat painting" so, at the most basic level, my work is an exploration of the medium of oil paint and the method of applying it to the canvas with a knife. There is an element of experimentation every time I paint – to see how far I can push the medium to achieve the idea I wish to convey. I work in many different series, most of them ongoing, and each beginning with a different concept. Inspiration comes from many sources including old walls and dilapidated buildings, signs, rocks and rusted things. I am fascinated with the accidental beauty found in debris. Subject matter varies but the method and medium remain consistent. My strokes differ considerably according to the series or to the subject. I try continually to invent new strokes and new ways to work the pigment with the palette knife. I work wet into wet, layering thicker pigment over thinner pigment. This becomes a journey with unpredictable detours and outcomes which must be resolved along the way. Once I begin, I work spontaneously and intuitively, allowing the painting itself to lead me to the next stroke. For me, painting with some degree of speed is a necessary part of the process in working wet into wet. It allows me to be able to scratch and scrape into the wet surface and allows the layers of pigment to interact in ways that can't happen once a painting is dry. I like the final results to show the energy and emotion that are a part of the creation of that painting. The residue of accidental happenings can also contribute to keeping my work fresh, exciting, alive and full of unplanned surprises. Maxine Graham Price grew up in a military family and moved with them to many postings in the southern and eastern climes of the United States as well as Germany. Being a shy child and finding it difficult to make new friends easily, Price found the one constant in her life, other than family, to be her ability to draw and paint. Price received her BFA degree in Art from the University of Texas at Austin and over her career has pursued various aspects of art including being a book designer, a fashion illustrator, an interior designer, a graphic artist, a portrait artist and a painter showing in numerous galleries and juried shows in the Southwestern United States. Many of her portraits hang on the campuses of The University of Texas at Austin, Texas A&M University, and St. Mary's University School of Law in San Antonio. 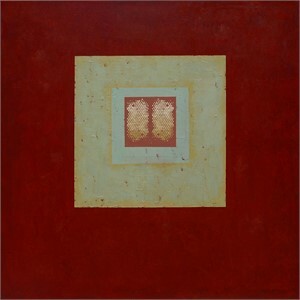 Her original oil paintings are in numerous corporate and private collections throughout the United States, Mexico, England, Germany, Japan and Bermuda. While still doing an occasional portrait, Price decided in 1992 to make creative painting a full-time pursuit and began a journey of experimentation and exploration, working with various mediums including watercolor, acrylics and liquid inks. 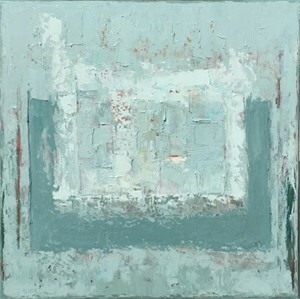 Several years ago, during a visit to San Miguel de Allende, Mexico, she began noticing abstract patterns in the ancient walls and began a series of abstract paintings, in oils with a palette knife, inspired by the colors and textures of old San Miguel. 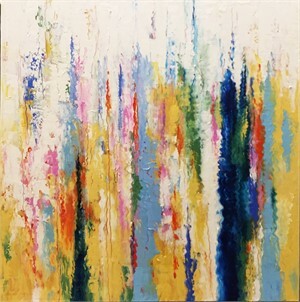 Thus began a love affair with oils, the palette knife and abstraction that continues today. Artist Statement: I began experimenting with the palette knife about 20 years ago in an effort to capture textures that I couldn't achieve with a brush. Now, I find that I am no longer satisfied with what I call "flat painting" so, at the most basic level, my work is an exploration of the medium of oil paint and the method of applying it to the canvas with a knife. There is an element of experimentation every time I paint – to see how far I can push the medium to achieve the idea I wish to convey. I work in many different series, most of them ongoing, and each beginning with a different concept. Inspiration comes from many sources including old walls and dilapidated buildings, signs, rocks and rusted things. I am fascinated with the accidental beauty found in debris. Subject matter varies but the method and medium remain consistent. My strokes differ considerably according to the series or to the subject. I try continually to invent new strokes and new ways to work the pigment with the palette knife. I work wet into wet, layering thicker pigment over thinner pigment. This becomes a journey with unpredictable detours and outcomes which must be resolved along the way. Once I begin, I work spontaneously and intuitively, allowing the painting itself to lead me to the next stroke. For me, painting with some degree of speed is a necessary part of the process in working wet into wet. It allows me to be able to scratch and scrape into the wet surface and allows the layers of pigment to interact in ways that can't happen once a painting is dry. I like the final results to show the energy and emotion that are a part of the creation of that painting. The residue of accidental happenings can also contribute to keeping my work fresh, exciting, alive and full of unplanned surprises.